❦ The contour waistband is faced with a completely different material: a satin polka dot. The seam was offset, so there is no chance of the facing showing on the right side. It appears the facing was attached the same way as in this tutorial on the Coletterie blog. I love the use of the contrasting fabric. It’s pretty, and it saves the fashion fabric. The contour waistband has a contrast facing. 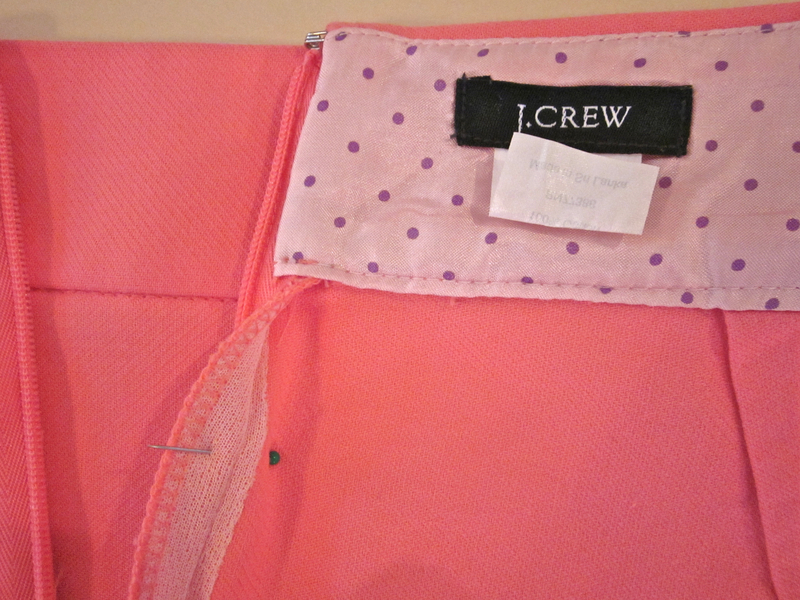 Note that the area for the zipper insertion is interfaced. ❦ The zipper area and kick pleat are interfaced with fusible tricot. 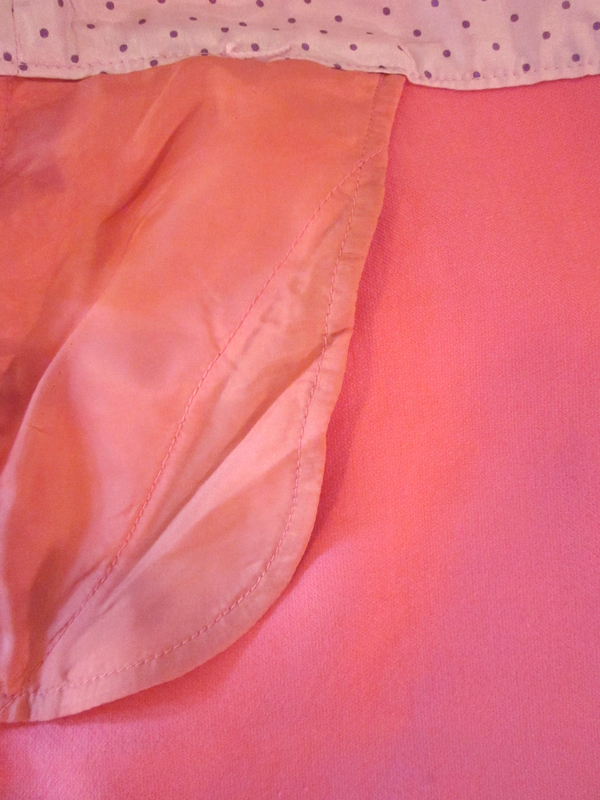 After putting a zipper in rayon recently, I thought a fusible interfacing might be a good idea to stabilize the fabric and eliminate unraveling. I’ll definitely do this for the next zipper I put in. The kick pleat has also been interfaced. 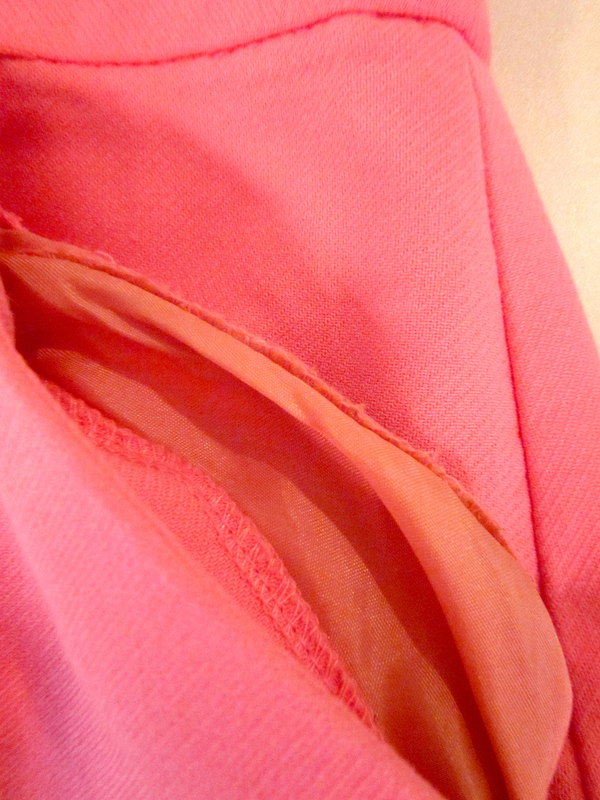 ❦ The pocket pieces are joined with a French seam. The seam was first sewn with a serger, then turned to do the French seam; however, the edges of the seam allowance stick out of the second stitching. This is inside the pocket, so no one will see it; but a French seam that actually fully encloses the first seam allowance would be nicer. 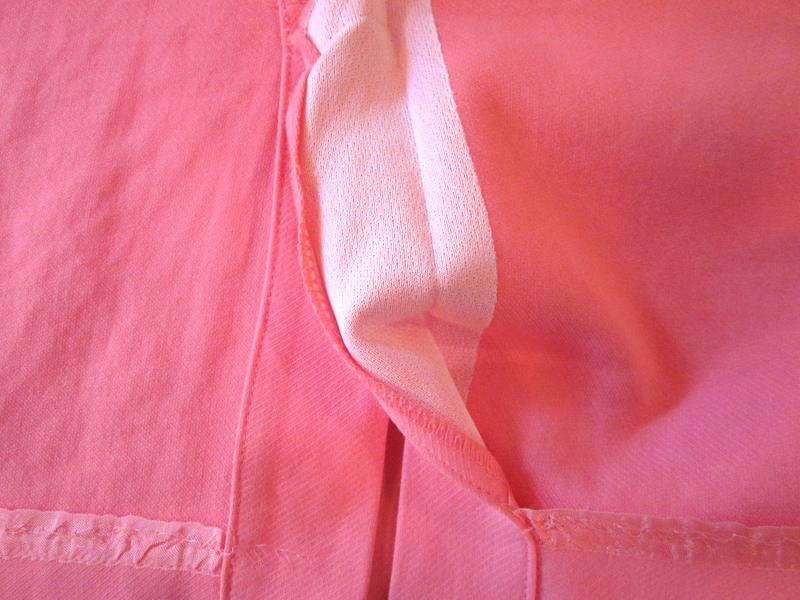 The pocket pieces have been joined with a French seam. The first seam was overlocked. The inside of the pocket shows that the first seam allowance isn't fully enclosed by the second stitching of the French seam. Better ready-to-wear garments can be the source of good construction techniques. In this case, there are some great ideas that I intend to incorporate into my sewing. All for the price of a little mending for a friend. You’re blogging now! Talk about the student surpassing the teacher. Kudos on the blog; it’s fab. And I love that my skirt was a topic for a post! Thanks, Jess. And welcome to my blog!